We Are the Nerds – a riveting look inside Reddit, the wildly popular, often misunderstood website, whose intensely-engaged users have changed the culture of the internet. 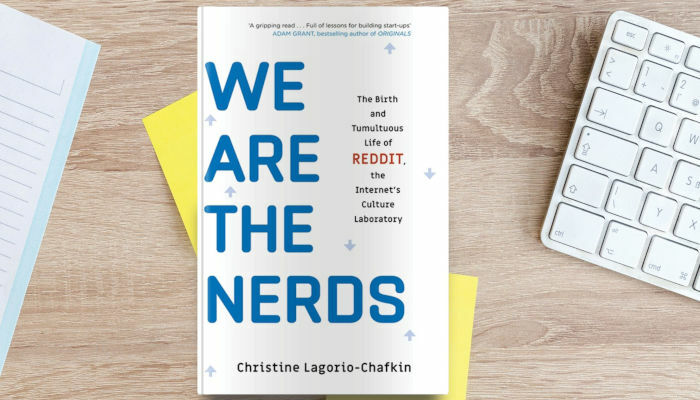 In the tradition of The Everything Store and Googled, award-winning tech journalist Christine Lagorio-Chafkin’s We Are the Nerds is the incredible true narrative of the birth, and life, of Reddit. Reddit hails itself as ‘the front page of the internet’. It’s the sixth most-visited website in the world – and yet, millions have no idea what it is. They should be paying attention. We Are the Nerds takes readers inside this captivating, maddening enterprise, whose army of obsessed users have been credited with everything from solving crimes and spurring millions in charitable donations to seeding alt-right fury and even landing Donald Trump in the White House. Reddit has become a mirror of the internet itself: It has dark trenches, shiny memes, malicious trolls, and a heartwarming ability to connect people across cultures, oceans, and ideological divides. This is the gripping story of how Reddit’s founders, Steve Huffman and Alexis Ohanian, transformed themselves from student videogamers into Silicon Valley millionaires as they turned their creation into an icon of the digital age. But the journey was often fraught. Reporting on Reddit for more than six years, conducting hundreds of interviews and gaining exclusive access to its founders, Lagorio-Chafkin has written the definitive account of the birth and life of Reddit. Packed with revelatory details about its biggest triumphs and controversies, this inside look at Reddit includes fresh insights on the relationship between Huffman and Ohanian, staff turmoil, the tragic life of Aaron Swartz, and Reddit’s struggle to become profitable. In a time when we are increasingly concerned about privacy and manipulation on social platforms, We Are the Nerds reveals Reddit’s central role in the dissemination of culture and information in history’s first fully digital century. Rigorously reported and highly entertaining, We Are the Nerds explores how this unique platform has changed the way we all communicate today.